Frugal Planners, we feel your pain! Your biggest challenge is how to "do more with less". When it comes to meetings, incentive travel programs, and group events, you want to cut costs but add more wow. The tricky part is how to cut back without looking cheap. In other words, you want to "Trim the Fat, but Keep the Sizzle". We've gathered the best money-saving secrets from meeting professionals and industry sources, and added our own tried-and-true tips to create the "Ultimate Guide to Trim the Fat and Keep the Sizzle". This free checklist contains 35 smart and creative ways to save money and add huge impact to your events. up to 40% on your next meeting or event. Put these tips into practice, and you're guaranteed to please your attendees and satisfy stakeholders - making you a superstar planner! 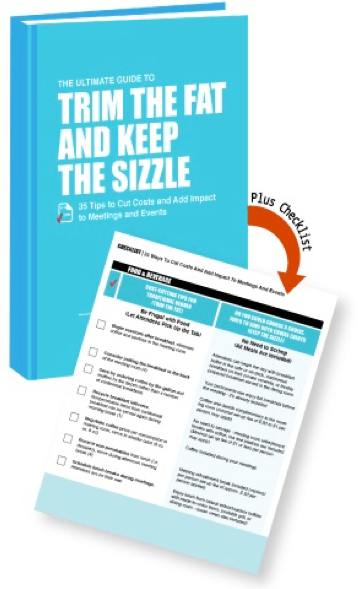 Download our free checklist: The Ultimate Guide to Trim the Fat and Keep the Sizzle - 35 Tips to Cut Costs and Add Impacts to Meetings and Events by filling out the form below!